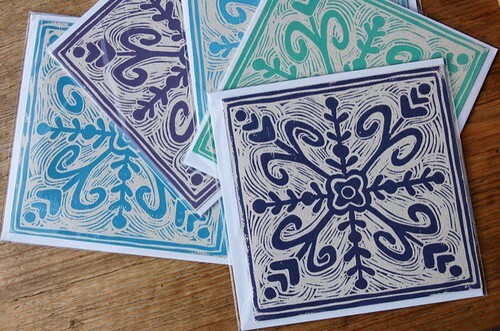 rosie made these amazingly beautiful cards from her very first linocut! fantastic results, i love the colours and i also love how so many of us were inspired to try something completely new for these gifts. rosie is super positive, super inspirational and shares an amazing blog with her sister, melanie. 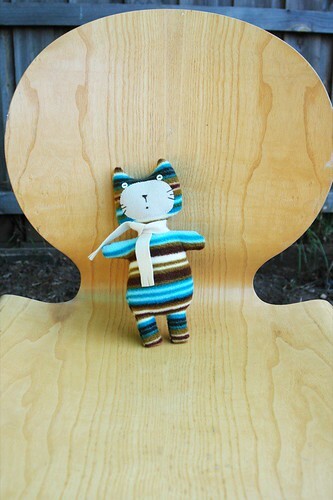 melanie also came along to blog meet and created these adorable wee kitties for everyone - check out the little scarf (and how lovely he looks on the fabulous chairs i picked up an the op shop on saturday for a mere $3 each)! i can't believe that melanie only started designing toys and creating patterns from them in the last year, her work is so infused with character and personal style. jhoanna made each of us a patchwork scarf and i can only imagine how much time it must have taken her! i love mine and sported it a bit over the weekend. 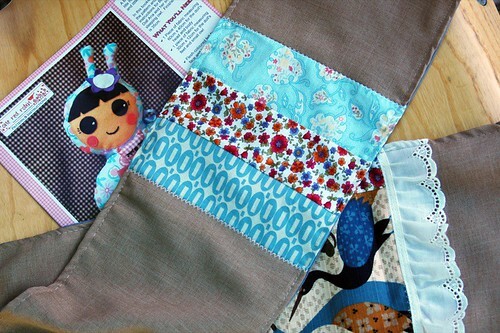 she also revealed a new pattern she now has available for her original design 'baby chibi doll' - cute! get yours here. 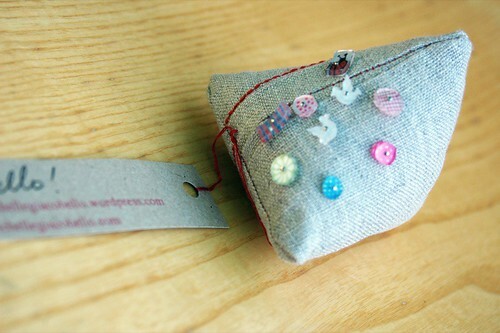 gorgeous pincushion and handmade shrinky dink pins from the ever-so-talented michelle. i loooove this little bundle of treats. the pins are so sweet and i've been needing a new pincushion for some time now - this one fits the bill quite nicely. plus i just found out from reading her blog that the shape is based on a mountain which makes me think of the rockies in canada which makes me love the whole thing even more! tina created this book cover from an armani offcut (very swish!) 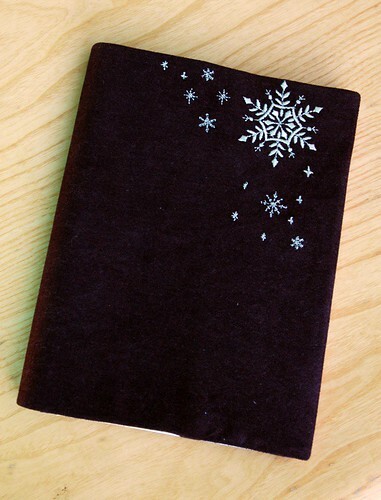 and machine embroidered her original design snowflakes on the front. it's lovely and soft and, again, i dig the snow reference even if i'm happy to not have to even see any real flakes this year. 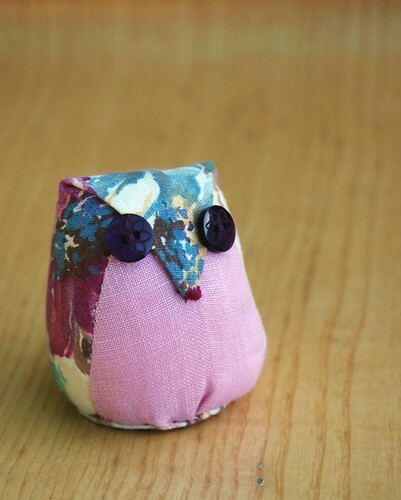 and finally, this great little owl made with vintage floral linen from tatania. this little fella is going to look lovely sitting on a wooden plate amongst my craft books and treats in my craft room soon. i'm looking forward to another meet up soon to get to know everybody a little bit more, especially those that i didn't really get a chance to talk to. i was sent an email from sooz a little over a week ago about a larger style blog get together happening in melbourne in july, you can read all the details here. oh my! the wee owl and kitty are so wonderful! wow, great things you all made for each other, love the kittens.